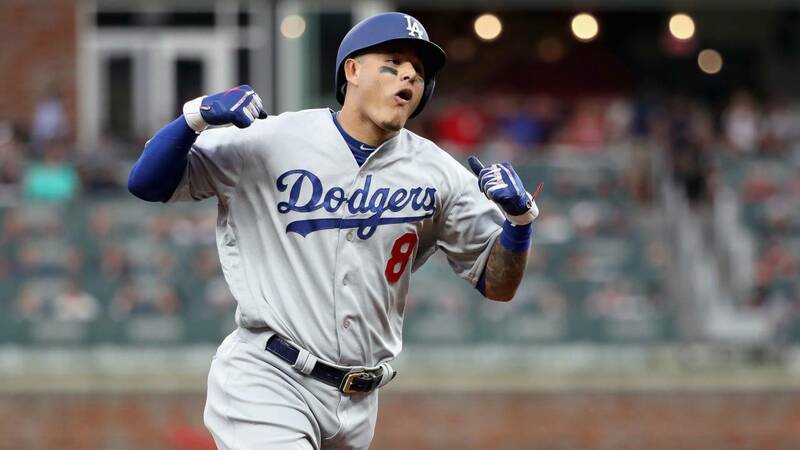 Manny Machado of the Los Angeles Dodgers celebrates as he rounds the bases after hitting a three-run homerun during Game 4 of the National League Division Series against the Atlanta Braves at Turner Field on Oct. 8, 2018. Baseball All-Star Manny Machado is reportedly making a deal for the history books. Multiple news reports say he has agreed to a $300 million contract with the San Diego Padres. The 10-year deal would be the highest contract for any free agent in the history of American sports. The 13-year, $325 million extension Giancarlo Stanton signed with the Miami Marlins in November 2014 still stands as the biggest contract awarded in sports history. Reports say Machado's deal is still pending a physical and includes an opt-out clause after five years. The Padres' owners haven't confirmed the deal, and say discussions are continuing. Machado is a four-time All-Star and a two-time Golden Glove Award winner. The 26-year-old infielder spent the first six and a half seasons of his major-league career with the Baltimore Orioles before being traded to the Los Angeles Dodgers before last year's trade deadline. He totaled 37 home runs and 107 RBIs last season while batting .297. Machado's signing means the other big free-agent domino in Bryce Harper could soon fall. The slugger has been seeking a similar deal to the one signed by Machado, but teams have been slow to spend big in free agency over the past few offseasons. Spring training officially began last week and full-squad workouts began on Monday.